My last full day at the conference started off cloudy and cool, which made for a comfortable, early-morning walk to the convention center. I have really enjoyed not having to rely on the shuttle this time around. I think I’ll look into booking my room for HIMSS18 within the next month. I must add, though, that I am not looking forward to heading back to Las Vegas. It’s one of the few cities I’ve visited around the world that just doesn’t agree with me (or perhaps it’s the other way around). 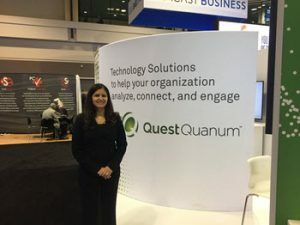 After catching up on email and other tasks in the press room, I sat down with Quest Diagnostics SVP and CIO Lidia Fonseca to get a feel for what the company has been up to. I’ve been keeping an eye on their patient-initiated testing pilots (check out my latest coverage at HIStalk Practice), and was eager to learn if the high-profile rise and fall of Theranos had offered any lessons learned. She was quick to tell me they don’t comment on the strategies of competitors, but did add that Theranos had “certainly created a heightened awareness of diagnostics.” It seems reasonable to assume that consumers might trust a company like Quest over a startup like Theranos, given that Quest has been very intentional about playing by the regulatory rules, and seems to be rolling out consumer-directed testing methodically. 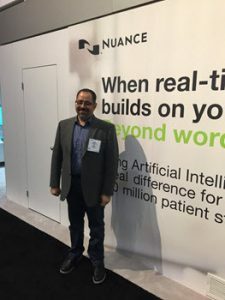 After hanging out at our booth for a bit, I trekked over to the Nuance to meet with Ehab Hanna, MD, CMIO at hospital management company United Health Services of Delaware. 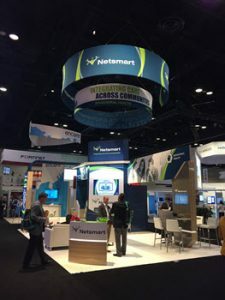 He took me through his organization’s roll out of several Nuance transcription technologies, the most recent of which includes PowerMic Mobile, and Cerner’s Document Quality Review, which includes Nuance’s CDI tech. He pointed out that the majority of his physicians (there are still a few holdouts who employ scribes at their own expense) are beginning to see the impact transcription can have on quality scores now that everyone is preparing for MACRA. 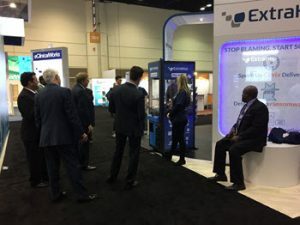 Hanna added that he would spend some time in the exhibit hall looking at analytics and data warehousing for population health management initiatives, and mobility tools for providers and patients. Walking to interviews certainly works up an appetite, and so Lorre was kind enough to hand me a HIMSS Bistro ticket left over from the HIStalk CMIO lunch. I set off on quite the adventure to find the place, which ended up being on the lower level of Hall A, tucked away in an inconspicuous wing. It was a nice excuse to get away from the multitudes and enjoy a meal that was a few steps above press room fare. 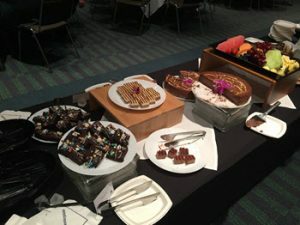 I have a huge sweet tooth and was quick to take advantage of the dessert bar. I’ve tried to eat well while I’ve been here. Any slip ups have been justified by the reality that the miles I’ll walk afterward will surely burn everything off. I found a much quicker way back to our booth, where I spent some time chatting with readers, many of whom stopped by to ask, “Was that really the last HIStalkapalooza?” Most everyone had an idea of how to save it. I found the notion of charging for tickets interesting, though I’m not sure that would actually cut down on the hassle Lorre suffers through every year. A Swiss provider on the prowl for new ideas said HIStalk could donate anything above and beyond breaking even to Donors Choose, which sounds good in theory. I was happy that everyone was so excited about the event, but I’m not sure that enthusiasm will be there seven months from now when we’d typically start canvassing for sponsors. My last chat of the day was with CommonWell Health Alliance Executive Director Jitin Asnaani. Their booth, much smaller than in years past, was crawling with reps from their member companies. 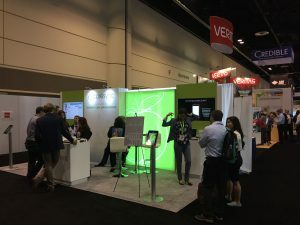 The organization now has 5,100 sites live, an exponentially huge jump from the 700 sites it was touting at HIMSS in 2015. Asnaani has been pleased by the expansion of membership beyond traditional EHR vendors. 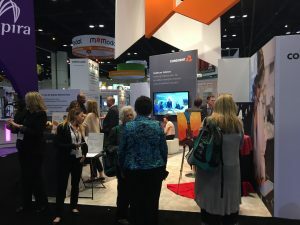 Representatives from the long-term and post-acute care worlds – long overlooked by programs like Meaningful Use – have expressed interest in connecting to the CommonWell network. 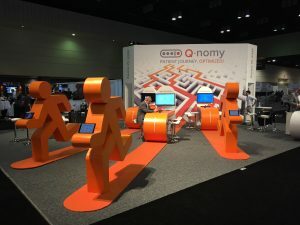 Even ONC has approached the alliance about the ways in which those sectors of healthcare can tap into the care coordination benefits offered by the interoperability it affords. 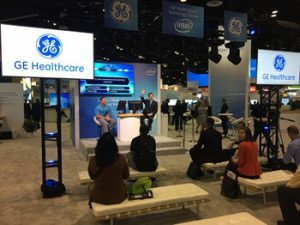 When I asked what had stood out to him at HIMSS thus far, Asnaani was quick to say the lack of buzz around interoperability, which everyone seemed to be touting the last time around. He’s hopeful that providers are starting to think of interoperability as par for the course. 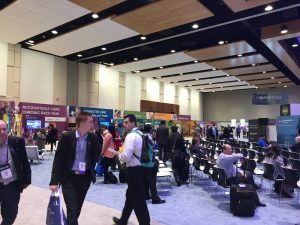 He also noted that attendees and exhibitors seemed to be a bit subdued given the uncertainty surrounding the new administration’s ACA plans. “ONC’s sessions have never been so popular,” he joked. Exhibit hall closing time was looming, so I took a quick walk through the exhibit hall to see if there was anything left worth seeing. Quite a crowd had gathered to watch GE Healthcare’s "Who Wants to be a Millionaire" game. 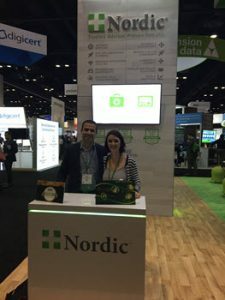 The Nordic team was fun to chat with. They were in full unload mode, and are sending me home with quite a treasure trove of goodies. 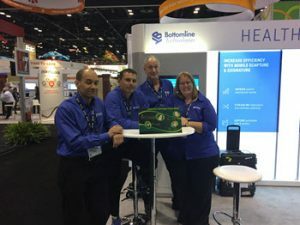 The Bottomline Technologies team was happy to pose for a picture. I was pleased to see they had prominently displayed their HIStalk sign. Conduent Health’s booth was booming. I noticed quite a few exhibitors with arcade-like grabbing games. I’m not sure I’d stand in a line to try and win a T-shirt. The men at ExtraHop’s booth had no such qualms. 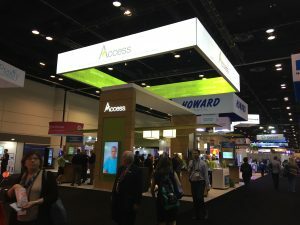 The Access booth seemed busy. I had a nice chat with one of their writers earlier that morning. It’s always nice to compare tips, tricks, and quirks with fellow scribes. The closing bell finally rang, at which point all of the remaining exhibitors cheered and clapped loudly. That didn’t stop attendees from continuing to wander the hall as sales teams boxed everything up. I finally got a chance to wander towards the Interoperability Showcase, where I passed this eye-catching setup. The Showcase still seemed to be hopping; a presentation was even about to get underway, which surprised me. 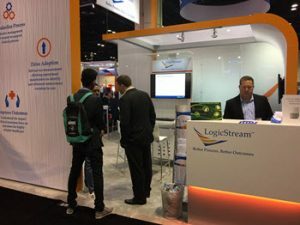 This marked the first time I’ve ever stayed until the bitter end of exhibit hall hours, and I was surprised to see so many folks still around. I did later hear that the conference center taxi queue and airport check-in lines were insane, making me love my decision to depart Thursday even more. I began the packing process back at my hotel rather than tackling my inbox, which I don’t think I can bear to attempt until I’m back home. 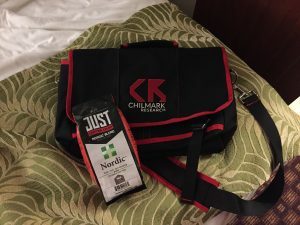 Two of my favorite giveaways include a full bag of coffee beans from Nordic and this messenger bag from Chilmark Research, both in the same color scheme of my favorite college football team. I would have included Arcadia’s Survival Kits, but I either used everything in mine or gave it away to friends suffering from blisters or impending colds. Note to just about everyone: Band-Aids and Emergen-C are must haves at HIMSS. I’m going to take a few days to decompress and then get back into the swing of things over at HIStalk Practice on Monday. Thanks to everyone who took the time to chat with me, invite me to parties, and stop by our booth to tell me how much they enjoy reading. HIMSS may be crazy, but it’s definitely one of the professional highlights of my year. See you in Las Vegas! Bummed you weren’t able to make it to happy hour but thanks for stopping by the booth and featuring us here. Looks like I was busy when you stopped by but would have been great to connect face-to-face.